The ECS layer code launches the bind-aware cursor matching algorithm at each soft parse of a bind aware cursor. If the new bind variable value selectivity is outside an existing selectivity cube (low-high exposed in gv$sql_cs_selectivity) then a new hard parse is done and a new child cursor with a new selectivity cube is created. If, however, the peeked bind variable selectivity falls into a range of an existing child cursor selectivity cube, ECS will then share the corresponding child cursor’s execution plan. Finally if a new hard parsed execution plan is equivalent to an existing one then both child cursors will be merged. The selectivity cube of the last created child cursor will be adjusted while the previous cursor which served the merge process will be marked un-shareable in order to save space in the memory and reduce the time spent during cursor pruning activity. The rest of this article shows, first, how the selectivity cube (low-high value) is computed for a bind variable value with a Frequency histogram. It then explains how two cursors with the same execution plan but different selectivity cubes are merged to form a single child cursor with an updated low-high range interval. The n2 column has a FREQUENCY histogram. Let’s put this select into a sql script and name it CurSelCubeFreq.sql. We will be back to this script later in this article. For this moment, we will put it on hold and we will embark on the cursor merge section. Notice that we have got, as expected, a new child cursor n°2 with a new range of selectivity that has produced an index range scan execution plan. Finally, what if, in the next run, I will use a bind variable value(10000) having a different selectivity but producing the same index range scan execution plan? That is how the Extended Cursor Sharing layer code works. 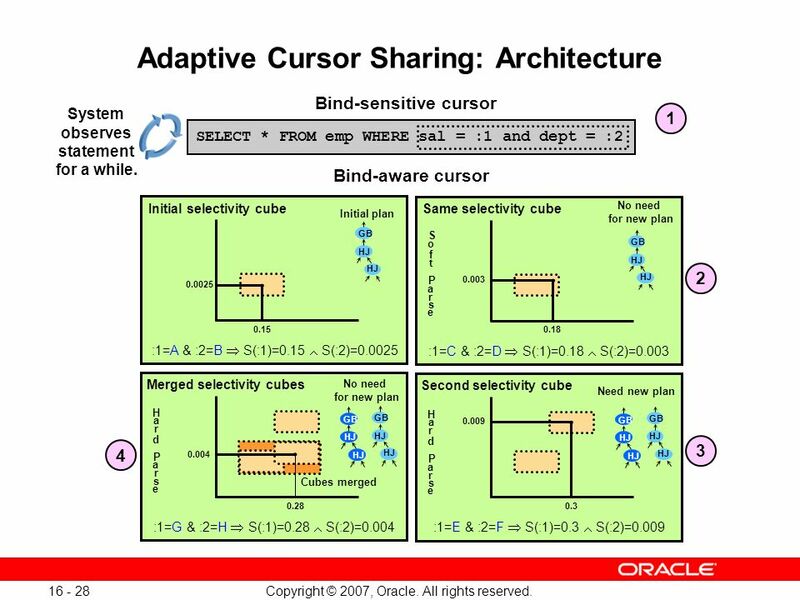 A combination of bind variable selectivities, with a possibly extendable cursor selectivity cube, allows Oracle to decide, at each execution of a bind aware cursor, whether to share an existing execution plan, compile a brand new one, or merge two cursors to form a single one to the detriment of a deleted one. This last action reduces the memory usage and the number of child cursors during the non-innocent child cursor pruning that occurs when a shareable parent cursor with multiple childs is soft parsed. Check and integrity constraints are DDL (Data Definition Language) operations. They consider TRUE and NULL alike. Query predicates are DML (Data Manipulation Language) operations. They consider FALSE and NULL alike. DDL predicate allows a row if it does not evalute to FALSE – which means it is allowed to evaluate to TRUE or NULL. DML predicate returns a row if it evaluates to TRUE – which means it will not return a row if it evaluates to FALSE or NULL. In this article I am going to show that using the SQL CASE statement we can make DDL and DML predicates behave identically. In contrast to the first created check constraint the new refactored one has successfully pre-empted a null value from being inserted into t1 table (we will see shortly why). Indeed the case statement works the same way in both DML and DDL predicates. And now the legitimate question is why does the CASE statement make the check constraint, which is a DDL predicate, consider FALSE and NULL alike? Protect yourself against the always threatening NULL by setting your column not null whenever possible. Bear in mind that the CASE statement, when used with its ELSE part, can not only make DDL predicate treats FALSE and NULL alike, but it behaves the same way during DML and DDL predicate.